Enrique Iglesias may be available for your next special event! Never before has a Latin artist accomplished so much in such a short period of time. Following in the footsteps of his father (Julio Iglesias) as a sensual Latin vocalist, with only one album and one year of artistic career, Enrique Iglesias in 1996 became the hottest, most popular, highest selling artist worldwide. His first album was a huge success and to date has sold more than 6 million copies. The first five singles of this album reached and stayed at number one for 23 consecutive weeks -- "Por Amarte," "Si Tu Te Vas," "No Llores por Mi," "Experiencia Religiosa" and "Trapecista." His second album, "Vivir," has also sold multi-millions. Enrique's talent stretches across several languages, having recorded in Italian, Portuguese, English, and his native Spanish. He said, "Yeah. I just have the best of both worlds. I can do English and I can do Spanish. What I used to do in Spanish was mainstream, mainstream pop music. That's what I wanted to do in English. That's what I wanted to create: a mainstream pop album  because that was mainly my influence growing up, as a little kid. That kind of music." In 1996 Enrique won a Grammy for Best Latin Performer, and in 1997 Billboard awarded him Album of the Year. He received the award for Favorite Latino Artist at the Sixth Annual Blockbuster Awards as well. Two years later, he scored an international smash with the single "Bailamos," followed by the release of "Enrique." He is one of the most desired men on the planet, even being awarded People magazine's 50 Most Beautiful People distinction in 1998. He responded to MTV's questioning about women in Miami chasing him all the time by saying "That's a good side of my job." booking entertainment, such as major name entertainers or celebrities, booking Enrique Iglesias, booking information on Enrique Iglesias, or hiring Enrique Iglesias for your special event, or to book or hire Enrique Iglesias, or if you are seeking the Enrique Iglesias booking agent for corporate entertainment or for a private party. Consider the opportunity to book Enrique Iglesias or other entertainers for a wedding, birthday, anniversary, business meeting or convention. If you are not a talent buyer, we are unable to provide Enrique Iglesias manager or management contact information. Consider this your official Enrique Iglesias booking agency web site – The booking agent who works for you! This company acts as an entertainment consultant or broker/producer and does not claim or represent itself as the exclusive agent, representative or management of Enrique Iglesias. 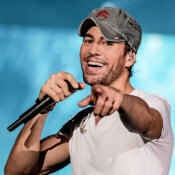 Enrique Iglesias, Latin music artist - booking agent. This artist may be available for your event. Book him if you can. You will have the time of your life!